Color, pattern, texture. Whatever your preferences and room design needs, we've got an upholstery fabric that works for you. Come into the store to see and touch the hundreds of cover options in person before you make your final decision on your custom sofa or chair covering. Durable and stain-resistant Elements QC Performance Fabrics and leather match covers are also available to order. We'll specially make a sofa or chair in the fabrics you want, and get it to you faster than those other suppliers. We're always working to reduce lead times and bring the product to to your home faster, usually in as few as 21 days. Check with the store to find a lead time adjusted for your location. This modern swivel glider recliner has a minimal design that is appropriate for young newly weds or a family looking for a living room with flair. The shape of the attached back continues the contemporary vibe while its reclining function adds a great deal of comfort and value. This specific model features a swivel glider allowing you circular and rocking motion perfect for newborns or your new favorite TV series. The Codie Swivel Glider Recliner with Rolled Arms by Best Home Furnishings at Ryan Furniture in the Havre De Grace, Maryland, Aberdeen, Bel Air North, Churchville area. Product availability may vary. Contact us for the most current availability on this product. Arm Sleek and Tasteful Rolled Arms. Footrest Operation The Recliner Gently Lowers the Seat Back Down and the Footrest Up. The Swivel Spins a Full 360 Degrees While the Gliding Function Rocks Back and Fourth when the Recliner is in the Stationary Position. Frame Construction A triple-doweled and glued seat design, special acetone based glues, engineered fasteners and a multi-step finishing process creates a lasting heirloom for your home. Padding & Ergonomics Cushions are constructed of high-density polyurethane foam, high-loft premium polyester fiber or a combination of both for the plushest, most unbelievably comfortable seat in the industry. Seat Support Sinuous wire springs are cross-wired to prevent sagging. Spring clips are coated with polypropylene to prevent squeaks. Small in size but never in comfort, the Codie collection is an easy way to make any new space feel like a cozy and established home. Codie recliners boast the sink-in comfort and timeless style that makes furniture memorable. Choose the option that works best for your family with choice of upholstery cover, movement type, and power upgrade. 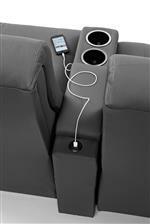 The console loveseat even adds extra storage and functionality to your space with cupholders and an optional power upgrade with USB charging port. The feel and quality of a Codie recliner is guaranteed to blow the competition away, making it a superb investment. The Codie collection is a great option if you are looking for Traditional Casual furniture in the Havre De Grace, Maryland, Aberdeen, Bel Air North, Churchville area. Browse other items in the Codie collection from Ryan Furniture in the Havre De Grace, Maryland, Aberdeen, Bel Air North, Churchville area.